The term “low vision” refers to individuals who have enough sight to use a visual browser, but who may need to enlarge text or use special high-contrast font and color settings in order to access online information. To accommodate low vision users, it is important tools not inadvertently disable zooming or the ability to adjust color/font settings. Note that low vision users may also identify themselves as being “blind” because the quality of their vision is so poor but may be at least partially relying on zooming technologies. In addition, some individuals may also use screen reading technology like JAWS/VoiceOver because of their condition. Some users may also be losing vision over time and so their condition could vary. The following sites provide information and simulations of different low vision or other conditions that could affect how people read text. Low vision users need a mechanism to zoom in on content on a computer screen, sometimes to a great extent. Some users implement implement custom settings or style sheets to override the formatting specified on a Web page or document. The adjustments these tools make depend on the user’s settings, and can include zooming, light text on a dark background or use of preferred fonts. 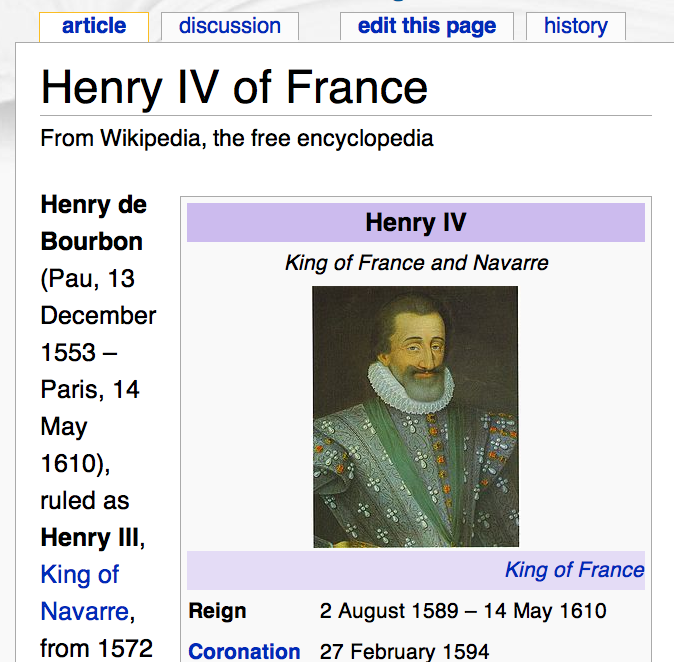 This image shows an example of the Wikipedia entry for King Henry IV of France zoomed to a level that a person with low vision might require. 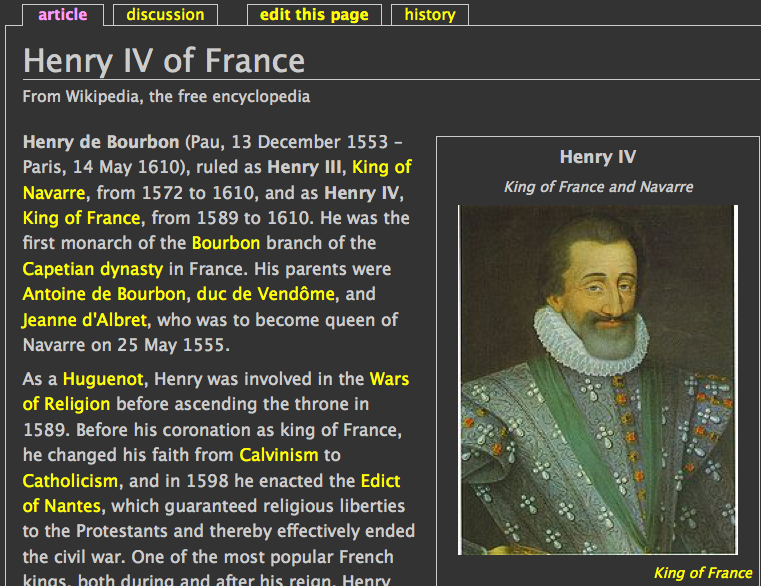 This image shows an example of the Wikipedia entry for King Henry IV of France as intended for another low vision user. This page uses CSS to display light text on a dark background in order to reduce glare. Note that the links are yellow, not blue. Low vision users need technology that allows adjustments in visual formatting. Cascading Style Sheets, employed through HTML, are one way to enable this, since users can use their own styles. Flash, Word and PDF and most modern browsers also enable zooming. Vector graphics and text is generally preferred over a raster image (e.g. PNG, GIF, JPPEG) whenever possible. Users, particularly older users, who may wish to zoom in on the text of a particular Web site because of small font size. In addition, some color combinations (i.e. those with bright colors) and fonts are difficult for all users to read.